Luo, Shiyu, CA Valencia, J Zhang, et all, T. Huang. 2018. Biparental inheritance of mitochondrial DNA in humans. Proceedings of the National Academy of Sciences 115(51):13-39-13044.doi: 10.1073/pnas.1810946115. Summary. 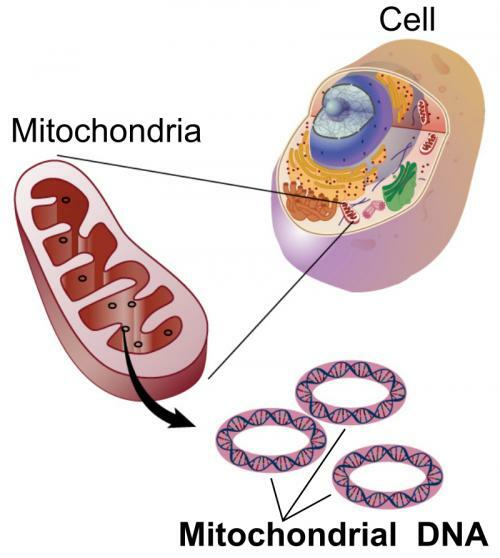 Mitochondria are components of cells and contain their own DNA (mtDNA) separate from the DNA in the nucleus. Mitochondria are normally transmitted exclusively from mother to child through the cytoplasm of the egg. Usually, a person’s mitochondria all have the same, or nearly the same, DNA sequence, but mutations may occur, and sometimes cause disease. Three unrelated patients suspected of mitochondrial disease were studied, and discovered to have higher than usual variation in mitochondrial DNA. Comparison of mtDNA variants among members of each of their families revealed that some members from each of the three families had mixtures of maternal and paternal mtDNA. Paternal transmission of mtDNA has been thought not to occur, and at least twenty previous reports of possible paternal transmission have been dismissed as due to sample mix-up or contamination. This study shows that mtDNA can occasionally be transmitted from father to child, possibly due to a genetic defect in the enzyme that normally eliminates paternal mitochondria. This discovery may lead to improvements in understanding mitochondrial diseases. Comment. The report of paternally transmitted mtDNA has significance in at least two different ways. First, it illustrates the “power of the paradigm” in which previous reports of mtDNA passed from father to child were dismissed, in some cases probably erroneously, because they did not fit with the accepted paradigm of exclusively maternal transmission. Scientific consensus should not deter from further study. Second, the possibility that both parents may, occasionally, contribute mtDNA to their offspring confounds calculations regarding the age of the proposed “mitochondrial Eve.” Based on exclusively maternal transmission of mtDNA, some scientists calculated that all humans share a female ancestor that lived approximately 150,000 years ago. Paternal mtDNA transmission would invalidate the time calculations and allow for a much younger date for the most recent common ancestor of humans. This should not be taken as proof of a recent creation because it is inevitable that all members of a population share a common ancestor at some time in the past, even if that common ancestor was just one member of a large group. However, it is interesting to note that one can argue for a date for “mitochondrial Eve” that is approximately consistent with the biblical time scale. Bandelt, H-J, Q-P Kong, W Parson, A Salas. 2005. More evidence for non-maternal inheritance of mitochondrial DNA? Journal of Medical Genetics 42:957-960. Doi: 10.1136/jmg.2005.033589. The authors are justified to be somewhat skeptical of unexpected claims of non-maternal transmission of mtDNA, but their own explanation that all reports are due to laboratory artefacts is also questionable. Gibbons, A. 1998. Calibrating the mitochondrial clock. Science 279:28-29. Doi: 10.1126/science.279,5347,28, Note that Gibbons’ statement is based on rate of mutation of mtDNA, which is a separate issue from paternal transmission.